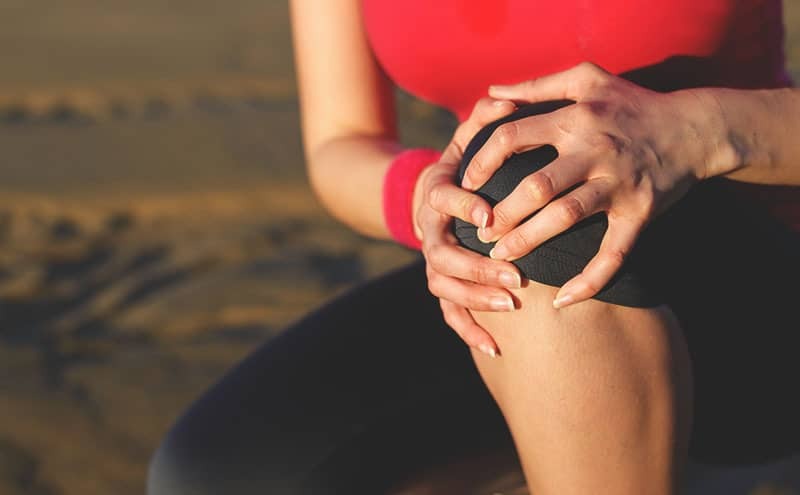 A patella dislocation occurs when the patella (kneecap) moves out of its natural position and usually happens when the lower leg is rotated. A dislocated patella is very painful and can often immobilize people for a period of time. The patella can sometimes be put back into place and a knee brace can also be used to manage the problem. In severe cases surgery may be required to fix a dislocated patella. Physiotherapy is usually needed when the patella is healing and a knee brace is often prescribed by doctors and physiotherapists. A clinical study concluded that wearing a knee brace can help with a dislocated patella. Who Needs to Use a Knee Brace for Patella Dislocation? Anyone who’s dislocated the patella can benefit from wearing a knee brace until the injury has fully healed. Patients can wear the brace during the day to support and protect the knee joint. Any support that you can give your knee joint while it heals is going to be beneficial. You can also wear some knee braces at night as long as they’re comfortable and not too tight. When we’re sleeping we aren’t aware of our body’s movements and stabilizing the knee can be a good idea. If you twist your knee during your sleep you could cause further damage to your injured knee which should be avoided. You may also need to wear a knee brace following surgery on a dislocated patella to aid your recovery. Following a surgical procedure on the knee there may be some swelling and discomfort. Using a knee brace to support and take some stress of the knee may help to speed up your recovery. If you’ve recovered from your dislocated patella it’s still worth wearing a knee brace to protect your knee. If you plan to do any physical activities such as walking, running or playing sports you should wear a brace. The protection that the knee brace provides may help to prevent further injuries. How Does a Knee Brace for Patella Dislocation Work? The knee braces that are used for patella dislocation usually have a reinforced hole that fits over the kneecap. The hole helps to keep the patella in a natural position and it prevents it from moving out of place. Restricting the movement of the patella is an effective way to manage the pain associated with a dislocation. Some of the knee braces also have reinforced side supports or steel springs to provide some lateral support. Lateral support helps to prevent the knee from twisting which is one of the ways the patella can get dislocated. The kneecap should be front facing and some lateral support will keep it in this position. A knee brace may also provide some compression which has a few benefits when recovering from an injury. Compression can help to increase blood flow to the muscles which can aid healing. Compression also stimulates lymph fluid which carries vital nutrients to damaged tissue. Compression can also help to manage swelling that often occurs after a dislocation of the patella. Swelling is the body’s natural way to protect an injury but can often be uncomfortable. How Do I Choose a Knee Brace for Patella Dislocation? It’s extremely important that your knee brace fits correctly so that you get the correct type of support. Measure above and below your knee before you buy your knee brace so that you get the correct size. The brace should be a snug fit but not so tight that it restricts blood flow. Choose a knee brace that allows for some adjustment so that it’s comfortable to wear. Most of the knee braces that are available can be adjusted with Velcro fastening straps. When your knee has been injured there may be some swelling and using an adjustable knee brace is a good option. Buy a knee brace that’s made from good-quality materials so it lasts and does its job. Most of the knee braces are made from neoprene which is durable, breathable fabric. If your knee brace has stitched seams the stitching should be strong so that the seams don’t split. The straps on the knee brace also need to be well made and long enough so that the brace stays in place throughout the day. The Velcro fasteners on the straps should also be of a high quality so that the straps can be secured. Poor-quality Velcro won’t stick properly and the straps will work loose and the knee brace will slip. Use a knee brace that’s easy to keep clean either by machine washing or hand washing. When you wear a knee brace for long periods you may sweat and a washable brace is essential. Keeping the brace clean will keep it in good condition and it’s also more hygenic. You should also make sure that the knee brace is easy to put on, take off and adjust. When you’re in pain due to a dislocated knee you don’t want to be struggling to put on or adjust the knee brace. Most of the knee braces are easy to fit but adjusting them to the correct tightness may take a few attempts. If you plan to wear your knee brace under clothing you should choose one that’s made from lightweight fabric. The fabric used to make the knee braces comes in different thicknesses and some of them are fairly thin. A thick or bulky knee brace is not going to be comfortable when worn under clothing. Ensure that the brace is the correct size. Buy a knee brace that’s adjustable. Use a brace that’s easy to clean. Buy a knee brace that’s well made. Use a brace that’s easy to put on. 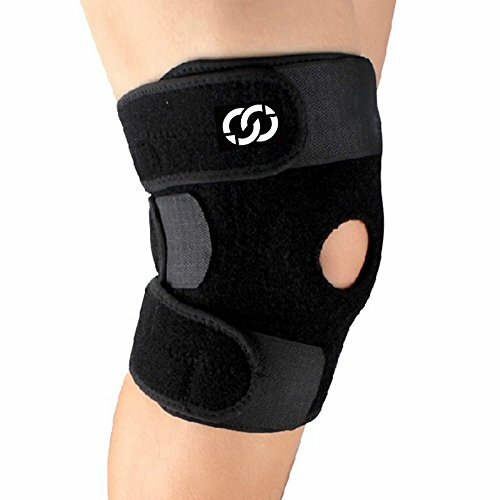 What Is the Best Knee Brace for Patella Dislocation? We looked at a range of knee braces that can be used following a patella dislocation and we’ve selected five. We looked at each knee brace in detail and examined price, quality, ease of use and the support provided. We reviewed five knee braces and pointed out some pros and cons for each product. This one-size-fits-all knee support made by Bracoo gives a good level of support for the kneecap following a dislocation. The open-patella design helps to relieve pressure and stress on the knee joint following an injury. The Velcro straps fasten to any point on the outside of the knee brace and the thick neoprene fabric is soft and breathable. Customers who purchased this knee support said that the neoprene fabric is very soft, comfortable and supportive. People said that the knee brace is very easy to put on and the straps are easy to adjust. Customers also like the fact that this knee support doesn’t lose its shape after being washed unlike other products they’ve used. A few customers who purchased this knee support said that the stitching is poor and the seams split after a few days. Customers also said that the brace moves around too much and they have to keep adjusting it throughout the day. People also said that this knee support was a little too thick and bulky and it made them sweat. This knee brace made by WIN.MAX is available in six sizes and it supports and protects the knee joint. Its open-patella design keeps the kneecap in the correct place whilst allowing for some movement. The neoprene fabric is soft and breathable to prevent excess perspiration making the knee brace comfortable. 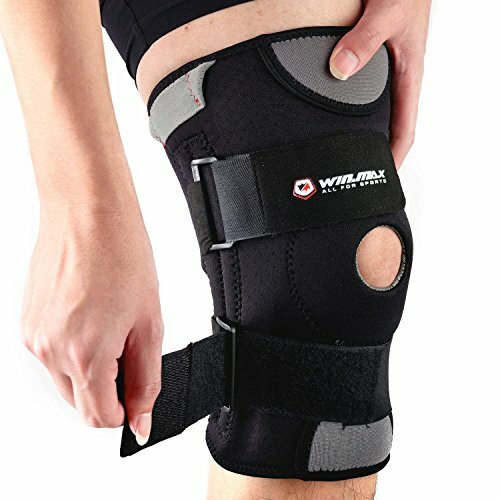 Customers who use this knee brace say that it provides an excellent level of support for their knee joint. People were impressed with the high quality of the neoprene and the excellent stitching. People also said that the knee brace is easy to put on and it can easily be hand washed and air dried. A few customers who purchased this knee brace said it’s too tight and cuts off their circulation which causes discomfort. People also said that the knee brace has a tendency to move around and they have to refasten it. Customers said they would’ve liked this knee brace to offer more adjustment. 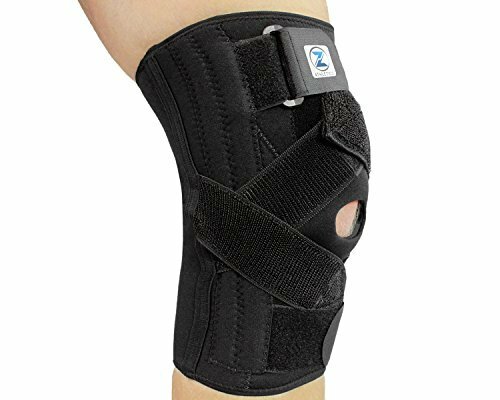 The knee brace support by Compressions is an open-patella design which supports the kneecap. One size fits most and the knee brace also has a side spring to provide some lateral support. The breathable neoprene fabric is lightweight and comfortable and there are anti-slip strips at the top and bottom of the knee brace. Customers who purchased this knee brace support said that it stays in place better than other braces they’ve used in the past. People said that the knee brace is comfortable and provides the support they need. Customers were also impressed with how easy this brace is to put on and adjust. A few people who purchased this knee brace said that the middle strap was too short and not useful. Customers also said that the knee brace isn’t long enough and the Velcro is poor. A couple of customers said that the neoprene fabric gives off a bad odour even after they’d washed the knee brace a few times. Neoprene has a bad odour. 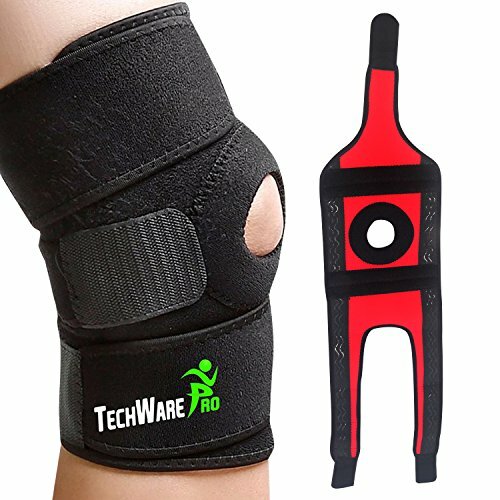 This knee brace support by Tech Ware Pro is available in four sizes and is suitable for supporting the knee following an injury. The open-patella design supports the kneecap as well as providing some compression. This neoprene brace features four spring stabilizers and is secured with Velcro fastening straps. Customers who used this knee brace support said that it’s very supportive and it helped them to recover from their dislocation. Customers said that the breathable neoprene keeps their leg cool and prevents excessive perspiration. People also liked that fact that this knee brace is lightweight and comfortable to wear. Some people who purchased this brace said they couldn’t get the straps tight enough and the brace kept slipping. A few customers said that the knee brace stretched after a few days and is no longer effective. Customers also said they would’ve like the knee brace to be a few inches longer. The Zenith knee brace is available in two sizes and it’s designed to support the kneecap. The brace is made from a mixture of neoprene and nylon to keep the leg cool and comfortable. The open-patella brace features Velcro fastening cross straps and a metal stabilizing spring. Customers who purchased this knee brace were impressed with the adjustability of it. People said that the brace provides adequate support for the knee whilst allowing some movement. Customers also said this knee brace is well made and easy to put on and take off. A couple of people who used this knee brace said that the stitched seams split after a few uses. Customers also said that the knee brace moves around and they have to keep repositioning it. Some people reported that the Velcro wasn’t reliable and could’ve been better quality. All of the knee braces that we looked at are suitable for supporting the patella following a dislocation. Each one of these braces are open-patella design and they’re all made from neoprene. Each knee brace has Velcro fastening straps and none of the products are overpriced. 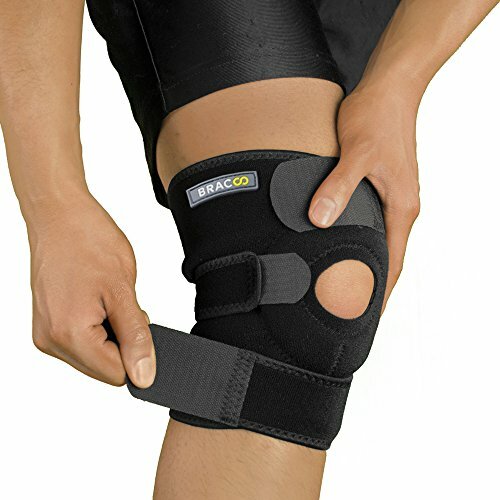 After looking at the knee braces in some detail the best knee brace for patella dislocation is the Bracoo Knee Support. This knee brace offers good value for money and it gives adequate support to the patella following a dislocation. The knee brace is easy to put on and adjust and the soft neoprene is comfortable against the skin. We also liked the fact that the straps can be moved to any position and a brace that washes well is also useful. What are the Best Knee Brace for Arthritis in 2019? What is the Best Knee Brace For Running in 2019?